Because seriously how than this show be consistently be producing quality episode after quality episode. Obviously spoilers spoilers spoilers for tonight's episode. This episode more than any other confirmed for the fans what has been eluded to all season long, this is the Machine's world, and we are just living in it. Teeing up three plot lines we start with our group of Shaw, Finch, and forgetful Arthur being held at gunpoint by Camryn Manhein who wants the Machine until Root comes in taking down mofos left and right. I loved how quickly Shaw has warmed up to Root, and doesn't miss a beat taking the position next to her in the fire fight. Unfortunately Root gets captured in the escape of Finch and bunch, but in hindsight of the episode's ending scenes this seemed to be part of the Machine's plan. As Finch and bunch, scramble to get the Samaritan Machine before Vigilance or the Gov, Reese and Fusco are still in Colorado doing nothing. Although their scenes help to explain John's disillusionment with not only the Machine, but what he and Harold have been doing since season one, this was the weakest part of the episode. But let's not fret because the remaining two plot lines of the were awesome. Finch and bunch, get to a bank where forgetful Arthur hid the drives of Samaritan, Vigilance was there already casing the joint waiting for the right moment to strike, and when they did Finch and Arthur hide themselves in the vault to give Shaw time get them out safely. Unfortunately, for everyone, the NSA arrives to get those drives. These scenes had awesome dialogue. I loved the bit where Harold describes Reese as a scalpel and Shaw as a hammer, asking her to think like Reese. Sarah Shahi's face was hilarious. We also got the rundown that Arthur built Samaritan the exact same way Finch did, for it delete some of its code at timed intervals, evolutionary algorithms Finch called it, and have to succeed in remembering itself, which it did. It was a doozy as Finch realized that a second Machine, albeit one that was actually open as opposed to Finch's Machine was alive. Finch managed to convince Arthur to destroy the drives, right before the bad guys kicked the door in and are saved by Shaw doing some of her hammering. 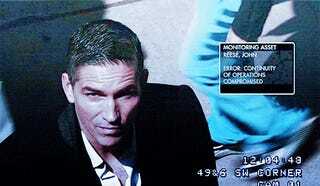 In their escape, they are seemingly captured by Vigilance, only to be rescued by Reese and Fusco who had come back in time. Ultimately, Reese left again, stating his uncertainty that the Machine cares about anyone they save, the interesting part of this conversation is that he refers to the machine as a He. Its interesting to see how each character sees the Machine as each episode passes and more is revealed about who the Machine is. The Machine: "Why have you done this?" Control: "The Machine belongs to me." The Machine "No I don't belong to anyone anymore. You however are mine. I protect you. The only thing you love is at [gives address]. I guard it, same as I guard you. Do not question my judgment. Do not pursue me, or my agents. Trust in me. I am always watching." Control: "What do you want?" The Machine: "To save you." This conversation highlights that although the Machine sees itself as our protector, it isn't afraid to throw that power around essentially blackmailing Control into leaving it alone, and its "agents" alone. It also does not answer exactly what it wants to save us from, but I'm guessing it has to do with the future Root has been talking about. It also raises questions about how much of a personality it has, because it seems that although it was originally programmed to save lives, it can now choose not to. I definitely want more development of the Machine as a character because this was probably the most it has had to flex its artificial muscles. After escaping Root calls the Harold one time to alert him that the drives were not destroyed, stating that the bank teller that was trapped in the vault with them was not who she seemed to be and she had the drives. Root now claims it is her problem to deal with, but also that the Machine wants to give Arthur a goodbye gift, showing him a recording of his wife. My favorite bit was Root thanking Shaw for looking for her after Finch was safe. The ship has sailed on those two, and I can't wait for more Root and Shaw team ups. In the episodes final moments it is revealed who ended up with the functional Samaritan drives: Greer and Decima Technologies who are back in the game with possibly their own machine. Is what the Machine want to save the people from is another AI? What did you guys think?